Hello Fall. Silver Looks Good on You. Hello! So many things are new at Blue Dot after a summer of making, planning and growing. (See above: making!) I thought I’d stop for a moment to review and share all the changes. It’s been a big six months. In that time I’ve partnered with stores in two new states — all of them lovely independent boutiques run by creative, interesting and hard working people. One of these states is my native Oregon — an especially proud development because, well, I love Oregon. Each shop is quite different from the others and working with them has been a learning experience and a joy. Blue Dot is now also in the Brooklyn Botanic Garden’s gift store, just up the street from us. That was a wonderful full-circle moment because so many of my designs had their start in the garden. Here are a few of those pieces. Blue Dot at Brooklyn Botanic Garden gift shop. Currently I am gearing up for the Greenport Maritime Festival this weekend. It’s a three-day outdoor party, so I have an eye on the weather predictions, but I think we’ll be warm and dry enough to enjoy seaside treats (scallops for me please! ), North Fork vino, live music and the work by all the arts and crafters who will be there. For some reason, too, I have this idea that sea-themed events are implicitly happy, and knowing that is what’s at the end of this week of prep is making me whistle as I work. And knowing that 40,000 visitors attended this event last year is pumping me up. If you’ll be there, look for the Blue Dot table and say hello! I’m also looking forward to finally visiting a wonderful store I’ve been working with in Greenport called The White Weathered Barn. The proprietor and her husband make a significant amount of their store’s inventory — that’s kind of a dream for me. And they are rocking it. Here is some of my sea-themed silver in their shop. I’m also working with a new online shop that I would like to point you to. Their website is beautiful and their company culture seems really nice. Maybe it’s that famous Canadian love? Meet Fairgoods. They did such a nice write up about Blue Dot Jewelry. It also features my face as big as I’ve ever seen it online. Hello! I also love being a part of the very southern-and-loving-it Bourbon & Boots. Here are a few of my pieces, as photographed by their talented selves. And for good measure, a bunch of post earrings out in La Crosse, Wisconsin, with the shop owner’s sweet note on her Facebook page. I’m so grateful for all of these opportunities. We know that positivity is contagious, and I think in many ways the same goes for the creativity. The people I’ve been meeting are making this jewelry adventure exponentially more rewarding. This coming Sunday will find me on Main Street in Greenport, so I’ll say now, happy fall, officially, almost! Time for blankets, tea and sweaters. One thing I love about using my phone as a camera is that my photos are at my fingertips when I’m in the mood to reminisce. I can quickly escape from the subway back to the middle of our last getaway. With the weather suddenly a good bit cooler, I’m already looking back fondly on our well-enjoyed summer. Before the storm, only a few brave souls were out on the beach. In the distance is the town’s very tall wind turbine. This is a water tower — can you believe it? You can read here about how a millionaire’s wife asked her husband to “do something about” the view from their estate of a 276,000-gallon water tower, and so in 1902, he revealed its transformation into possibly the prettiest water tower in the world. We had a really nice time. We were treated to burgers at the deliciously cheesy Wahlburgers (which has gluten free buns, which will make my day any day) and spent a lot of time catching up with our friends. Back at home, these are the tiny post earrings I made from my Quarter Deck purchases… fifteen tiny starfish for one dollar, yes please! 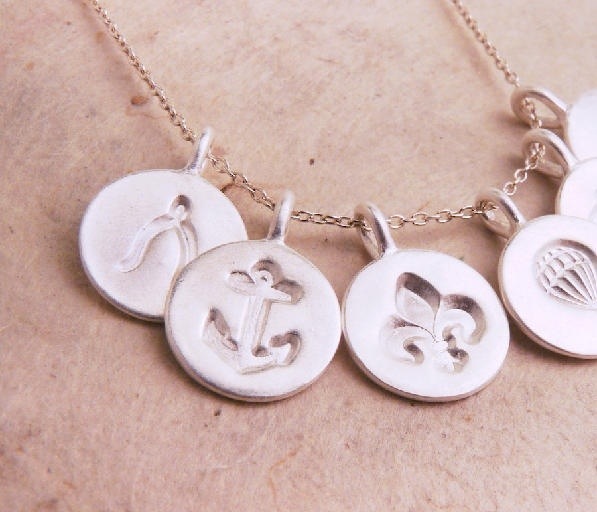 These are little necklace charms. I plan to grow this line as far as makes good sense. 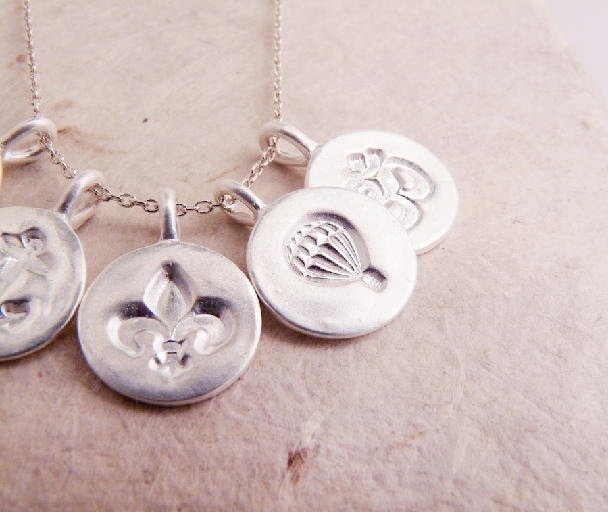 I love each charm’s size, and feel, and personality. One or two can be added per chain. What else would you like to see here? I’d love to hear your thoughts! Additionally I want to thank all of you who voted for my rings in the UncommonGoods design challenge. I did not win, although I was one of the top five final contenders who moved on to the judges round. It was a great experience. My sincere appreciation goes out to all of you who gave your time and support! After an inspiring Fourth of July trip to the beach, I’ve become lost in making sea life pendants. A small part of me hopes that summer will never end. Above are a few of the final silver pieces — the tiniest crab claw and tiniest sea horse. Below they are pictured as unfired clay awaiting the kiln. I hope summer has found its way to you, wherever you may be! Blue Dot is in a Contest – Your Vote Would Mean the World! Hello hello! My twig stacking rings are in the running for the UncommonGoods Jewelry Design Challenge! I would so appreciate your vote. Here is the link. Each person can vote just once by July 16. Each vote is valuable! A million times, thank you. The winning design will score a vendor contract with UncommonGoods. (How great!) There are some other beautiful designs there too – check them all out. UncommonGoods is a neat place. As a shopping site they focus on handmade and sustainability. When they are considering offering new items for sale, they often let their shoppers vote, just like in this contest. It’s very community oriented. And they won’t sell leather, feathers or fur. Thanks for your support! Here are some more photos. 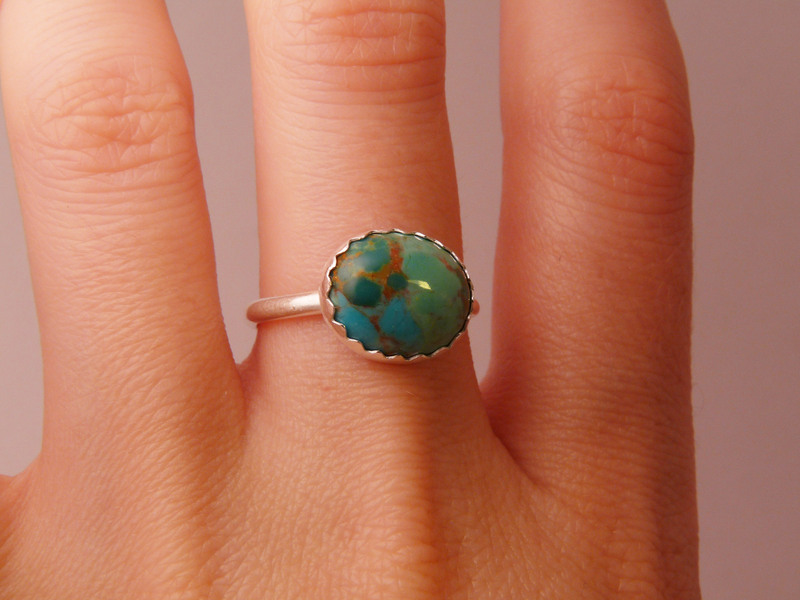 I adore turquoise. I’m overjoyed to be working with it. Setting no-fire stones, while a relatively simple technique, is new to me. Also, color isn’t generally an attribute of silver work, and it’s the one thing I’ve craved more of, so that part is making me happy, too. Here is a simple band to show off this stunning stone. Although these were made for the craft fair last weekend, I wanted to photograph them for my records, and to share with you. They were made from different leaves than I’d ever used before, and I sure wish I could say what species they are, but they were so varied that I had an overwhelming appreciation – again! – for how diverse the creations of nature are. These were all collected on one walk! This weekend kept us on our toes – eye-crossing heat, sudden rain, a sporadic wind that felt like a gift but had a habit of flipping over anything not pinned down. The many tremendously friendly people we talked to made it all worth while. This was my first outdoor market and I learned that the experience can be even more enjoyable if one’s booth neighbors are interesting to talk to. We lucked out. And, as the weekend comes to an end, I love to think of my jewelry going off to be worn around the world! There were many features to this event – 300 vendors, food, DJs, jewelry making workshops with a team from Martha Stewart magazine, and a clear view of the Empire State Building across the East River. As I said, it was hot. Beyond wanting ice cream hot. Huddle in the shade hot. There I am with Ian, on the left, who came from Taiwan with his beautiful, soft Italian leather goods, and Gillian, who makes wood-burned flasks and pocketknives, in town from Providence. When the DJs played Beastie Boys, Ian showed us a photo of his cute 10-month-old son back home in a Beastie Boys t-shirt! Hooray for a well-run, successful event. We loved seeing everyone who came by (especially some familiar faces) and look forward to next year’s Renegade Craft Fair! This has been a big week for Blue Dot – we’ve been a featured seller on Uncovet.com. It’s been an exciting few days! 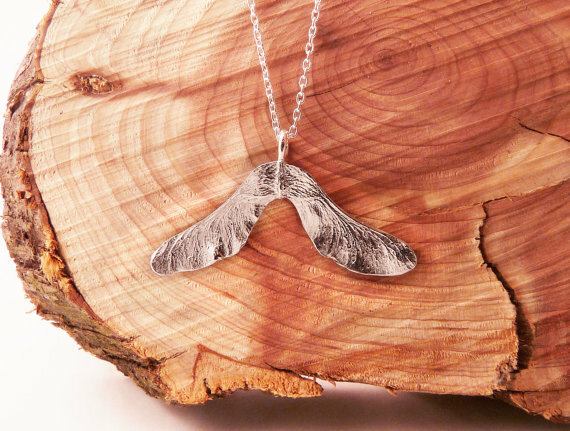 Uncovet promotes a curated set of unusual, clever and crave-worthy items by super talented artisans. Seeing eight of my designs mixed in has been a big time thrill. I’m grateful and happy… and very much needing to clean up my studio space! Wearing these together makes me feel like nature woman! 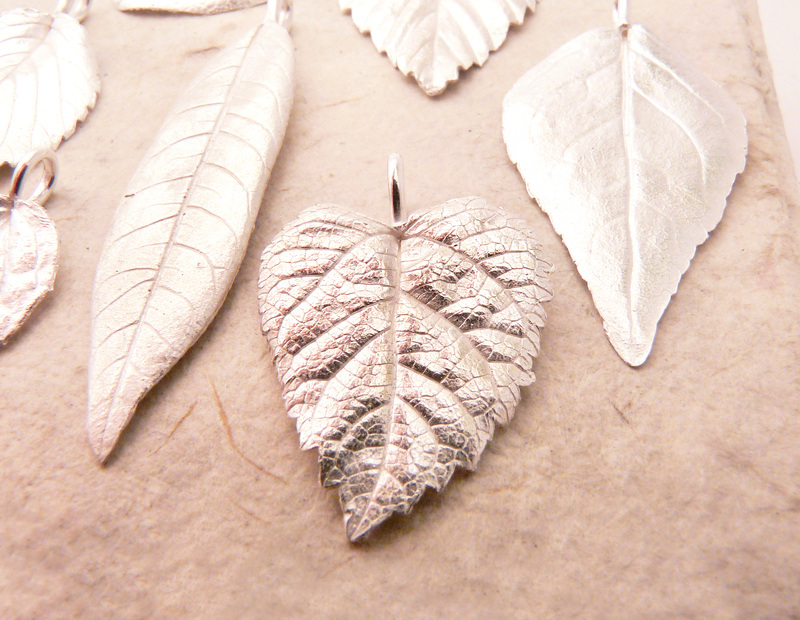 But I am always recharged by making new nature-inspired pieces. The maple helicopter was a find in Central Park. The twig stacking rings are new additions I’ve been wearing most every day! The detail goes all the way around the bands. Thank you, mother nature. It’s a great pleasure working with you.